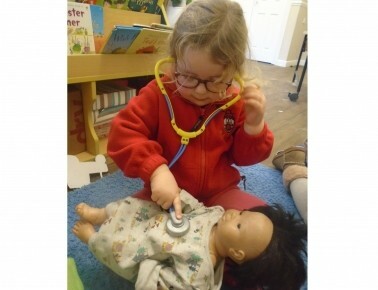 The children at Busy Bees in Rushmere had a very exciting day playing doctors and nurses today. Our Pre-school children set up a hospital role play corner and enjoyed operating on and bandaging each other up. The children learnt some basic first aid essentials and talked in depth about previous visits to the doctors and hospital. The children shared stories and looked at information books to further their knowledge and understanding of the human body and how to stay fit and healthy. 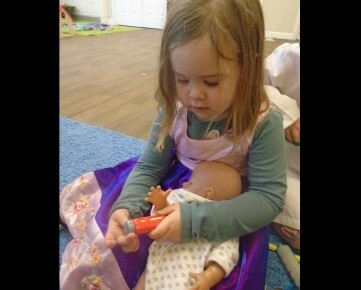 Engaging in role play experiences such as those from today play an essential pat in children's development. It encourages children to develop an awareness and understanding with regards to the importance of exercise, healthy eating, sleeping and hygiene. The activities from today have also provided opportunities for the children to talk about significant events in their past and to learn about different occupations and ways of life.